A Canadian nuclear plant is stepping up to ensure NASA’s ongoing exploration of deep space continues for years to come. Ontario Power Generation (OPG) and its venture arm, Canadian Nuclear Partners, have teamed up to fill the gap left after the United States stopped producing the glowing oxide pellet back in 1988. NASA is teaming up with OPG’s nuclear facilities to replenish their inventory and fuel their existing (and future) fleet of space probes. Plutonium-238 acts like a battery to space craft. By emitting steady heat through natural radioactive decay, and using a solid state thermo-couple, it produces electricity aboard the craft to fuel it and keep scientific equipment warm enough to function in space. “Spacecraft’s usually use the sun to provide electricity to solar panels but that only works in the inner solar system,” Randy Attwood, of the Royal Astronomical Society, told CTV News Toronto. The proposed plan would have rods produced by Pacific Northwest National Laboratories (PNNL) in Washington State and shipped to Darlington where they would be inserted into the “reactor core” to produce the Plutonium-238. Unlike Plutonium-239, the 238 isotope is not weapons grade, thus impossible to use for a nuclear bomb and safe to move when handled properly. In a press statement released 2/17/17 the Department of Energy (DOE), in collaboration with the National Aeronautics and Space Administration (NASA), has reached an important milestone towards reestablishing the ability to fuel future space exploration missions. Now, a small quantity of newly produced heat source plutonium oxide (PU-238) is destined for use on the Mars 2020 rover. Like the Curiosity rover that has been exploring Mars since August 2012, the Mars 2020 mission will obtain its electrical power from a radioisotope power system called a Multi-Mission Radioisotope Thermoelectric Generator (MMRTG). 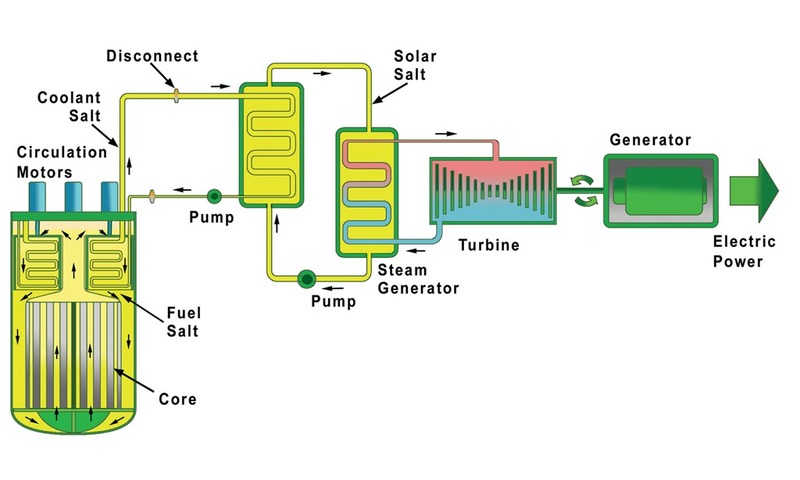 A MMRTG converts the heat created by naturally decaying plutonium-238 into electricity that can be used to run a spacecraft and its science instruments. Radioisotope power systems enable or enhance missions where sunlight is infrequent, obscured by dust, or dimmed by distance, making other sources of power impractical or insufficient. DOE made plutonium-238 at its Savannah River Site from the 1960’s until the 1980’s but that capability was terminated as the site’s reactor operations ended. Since then, the Department and NASA have utilized existing inventories of plutonium-238 and supplemental purchases from Russia to support NASA exploration missions through the mid-2020s. 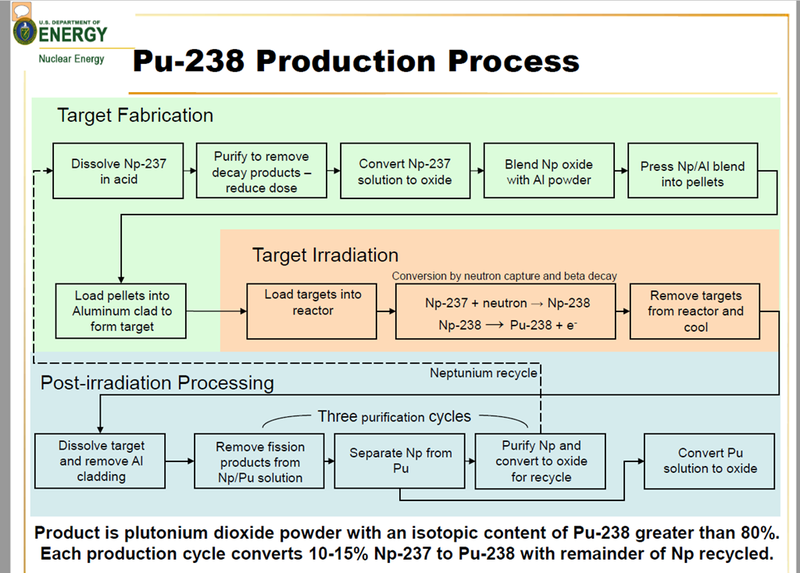 In 2012, DOE and NASA initiated efforts to reestablish the capability to produce plutonium-238 utilizing existing DOE research reactors at Oak Ridge National Laboratory and Idaho National Laboratory. Late in 2015, DOE produced the first new plutonium-238 in the country in nearly 30 years at Oak Ridge National Laboratory. 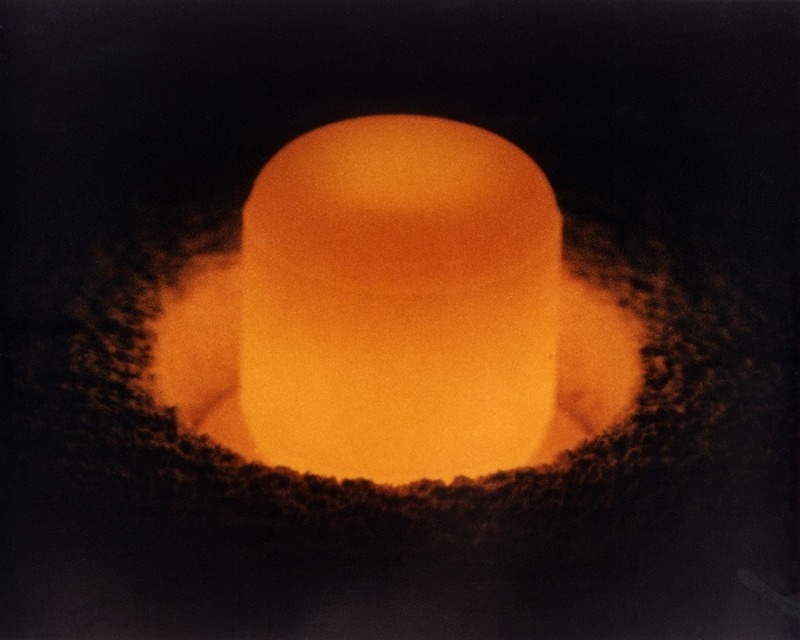 The plutonium was converted into heat source plutonium oxide this past fall and a portion was shipped to Los Alamos National Laboratory for analysis to verify its acceptance for use in space missions. The plutonium oxide was judged to be acceptable, and the agencies have agreed to a pilot demonstration that will include use of a small portion of the new heat-source plutonium oxide in the MMRTG under construction for Mars 2020 mission. Los Alamos National Laboratory will blend the new heat source material with its existing inventory to make the fueled clads for the radioisotope power system. (Space Reporter) The Europa project achieved an important milestone with the successful completion of a planning stage in which a list of science instruments to be carried on the probe was compiled. The mission will be powered by a radioisotope thermo-nuclear-power generator (RTG). (JPL web page on Europa mission) Europa, a moon of Jupiter, is too far from the sun for solar panels to be useful. Yet, Europa is one of the prime locations for possible extraterrestrial microbial life because it has a subsurface ocean, heat produced in its core by geological processes, and the chemical building blocks of life. If microbes are present on Europa, they likely live in hydrothermal vents in the underground ocean, much like those discovered in similar environments on Earth. While the $2 billion probe will orbit Europa, it will not land on the moon’s surface or confirm whether life is present. Its goal is limited to studying the subsurface environment and determining whether it is capable of hosting life. Ten instruments have been selected for placement on the spacecraft. High-resolution cameras will map the moon’s surface, and heat detectors will search for temperature variations and sites where plumes are erupting through surface cracks. Other instruments will penetrate surface ice with radar, measure the ice’s thickness, study the underground ocean, and analyze Europa’s plumes. (Wire Services) Proponents of nuclear power are hoping the seventh time is a charm at Kentucky’s capitol. The state Senate voted Wednesday to lift a moratorium preventing the storage of nuclear waste in the commonwealth. That action is viewed as opening the door to future nuclear reactor construction. Bill sponsor Danny Carrol admits, even with passage of this bill, such a project could be a decade away. Carrol, who is from Paducah, is optimistic the nuclear power bill will be considered by the House. Kentucky has considered nuclear energy as way to exploit its coal deposits through development of coal gasification and for other alternative fossil fuels. Carol has promoted Paducah as a site for development of an SMR. Do not discount the vision and nerve of William DeOreo, a civil engineer doing business in the city by the Flatirons. In an OP ED published in the Daily Camera on 2/26/17, DeOreo writes that Boulder could give up relying on coal-fired electrical power and instead build a molten salt nuclear reactor. DedOreo says that if Boulder owned and operated its own MSR, the unit would generate its annual energy contribution with approximately 66 pounds of fissionable material. At the same time, because of the nature of the reactor design it would generate less than 10 pounds of high level waste, all safely contained in the liquid salt. (NucNet) Russia’s state nuclear corporation Rosatom will make a final decision on whether or not to go ahead with construction of a Generation IV BN-1200 sodium-cooled fast neutron reactor at the Beloyarsk nuclear power station in central Russia by the end of the year. This report in Tass contradicts earlier reports that a decision might not be taken until 2019. The report said pre-project work had begun on the BN-1200. A a final decision on whether to proceed will depend largely on the results of operating Beloyarsk-4, the pilot BN-800 plant, which began commercial operation in November 2016. Russia is planning to build two BN-1200 units at Beloyarsk with commercial operation originally scheduled by 2025. (WNN) The U-Battery consortium, led by Urenco, has registered its micro-modular reactor technology for pre-licensing vendor design review with the Canadian Nuclear Safety Commission (CNSC). U-Battery is a ‘micro’ nuclear reactor which will be able to produce local power and heat for a range of energy needs, mainly targeting the markets for industrial power units and off-grid locations. Powered by Triso fuel, each helium gas-cooled unit produces 10 MWt, can deliver up to 4MWe as electricity and can provide 750 degrees Celsius of process heat. Triso fuel comprises spherical particles of uranium fuel with a triple carbon-coating which effectively gives each tiny particle its own primary containment system. The concept design of U-Battery was developed by the Universities of Manchester, the Dalton Institute (UK) and the Technology University of Delft (Netherlands) after the project was initiated in 2008 by Urenco. It is being developed by a consortium of Amec Foster Wheeler, Cammell-Laird, Laing O’Rourke and Urenco. The consortium aims to have a demonstration reactor operating by 2025, and estimates that by the 4th-of-a-kind unit, U-Battery’s capital costs will be between £40 and £70 million ($49 and $86 million). (WNN) China will complete construction of five nuclear power reactors and start construction of eight more in 2017, according to plans released by the country’s National Energy Administration (NEA). Planning for a further eight reactors will also be progressed this year. In its Energy Work Guidance Opinion for 2017, published on 2/10/17, the NEA said construction will be completed of the Sanmen 1 and Haiyang 1 AP1000 units, the Taishan 1 EPR and the Fuqing 4 and Yangjiang 4 CPR-1000 units. These, together with “other projects”, will add some 6.41 GWe of nuclear generating capacity. Also, the plans calls for construction of the high-temperature gas-cooled demonstration project in Shidaowan in Shandong province. It also said it would “prudently” promote the preliminary work of small reactor demonstration projects. Preparatory work is also to be carried out this year on another eight units. These include units 3 and 4 of Sanmen, Ningde units 5 and 6, and two units each at new plants at Zhangzhou in Fujian province and Huizhou in Guangdong province. Together with other projects, these will add 9.86 GWe of nuclear generating capacity. The NEA also said China will promote the export of its nuclear power technology by promoting the implementation of the Hualong One reactor design in the UK. The country will also strengthen its nuclear cooperation with other countries, including Russia and the USA. It will also seek “steady progress” on nuclear power project cooperation with Argentina, Romania and Turkey. Over the next five years China aims to have all four Sanmen and Haiyang AP1000 units in operation. It also aims to develop Hualong One demonstration projects at Fuqing and Fangchenggang and begin construction on the CAP1400 demonstration project at Shidaowan. The US press announcement didn’t mention that Pu-238 was actually going to be produced in a Canadian reactor because the US capability had long ago been shuttered. Another example of defeatism is the shuttering of the Fast Flux Test Reactor, which would have been helpful to test materials for fast reactors being developed by ventures such as TerraPower, since relocated to China.